We celebrated our wedding anniversary this past Sunday and tradition called for dinner out. Since we were at the cabin, I thought it might be time to try a new Supper Club. 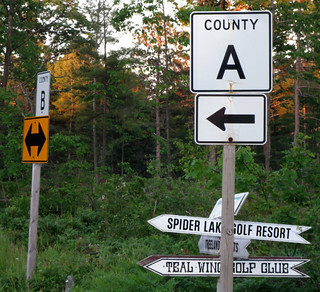 For the uninitiated, the "Supper Club" is an upper-Midwest tradition centered on Wisconsin. If you are a serious student of American culture, you will want to add this to your fact-file. Here is an article in the New York Times, a book and even a movie on the subject. There are certain standard menu items on a supper-club menu. Steak, of course, but always AYCE Walleye on Fridays and prime rib on Saturday. We were looking for something a little more special and found it here. 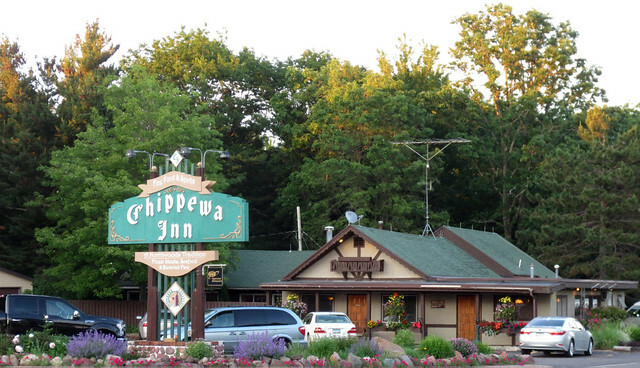 The Chippewa Inn can be found fifteen miles east of Hayward. 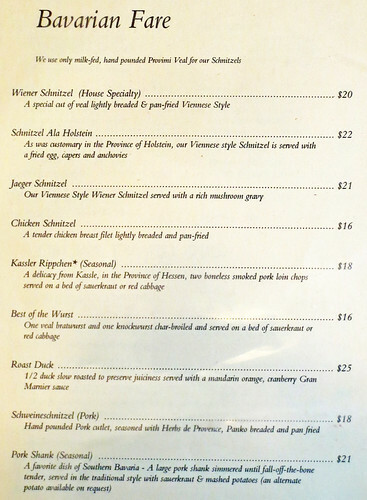 The location is easy to remember, it's at the corner of A and B, and offers a Bavarian page besides the usual fare. 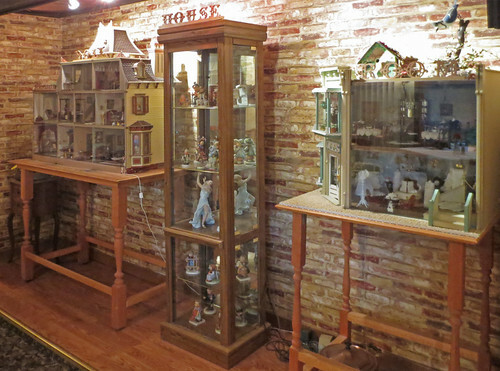 Keeping with the Bavarian tradition, you will find a couple of dollhouses and a case of Hummel figurines in the back room. How was the food? Very good. 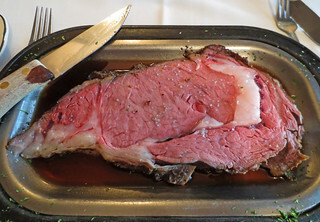 Here is the Bavarian Pork Shank (Eisbein, if you are German) and the prime rib. I suppose that when most fishermen think back to their visits to Pagac's Pines Resort near Gordon in the '50s and '60s, they recall the battle with a Northern Pike or a stringer of Bass and the pleasant outings on the lake. But I wonder if those thoughts might have pushed other, less pleasant memories to the back of their minds? 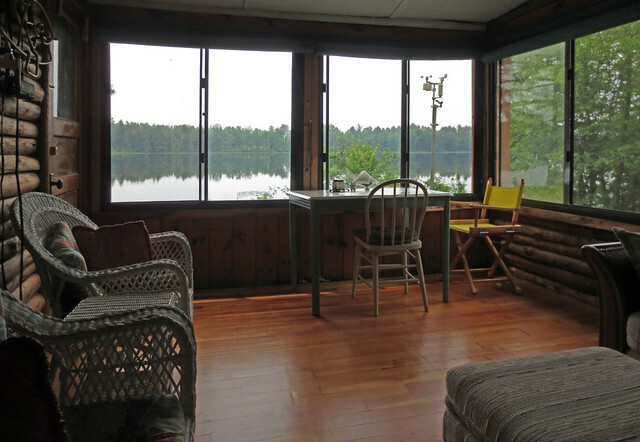 The evenings can be remarkably pleasant on the Gordon Flowage - provided you are behind adequate screens! Mosquitoes, gnats, and tiny creatures so small that they are known locally as "no-see-ums" abound beginning at dusk. It's so much fun sitting on our porch having dinner. Our entertainment has been a hummingbird that likes to sit on the wind direction indicator, a song sparrow singing his little heart out, king birds catching their dinner mid-flight, the squeaky gate song of the blue jay, squirrels chattering as they chase each other thru the trees, a chipmunk sneaking up to the cabin and fish jumping in the lake. It's totally calm so the lake is like a mirror, reflecting the trees of the island. The sky is totally overcast thru which the sun is a huge bright orange orb slowly descending. Warm temps and the windows are open to all the sounds. We wished a couple deer would saunter past but our deer are too shy for that. Very relaxing. I finally settle on this picture. 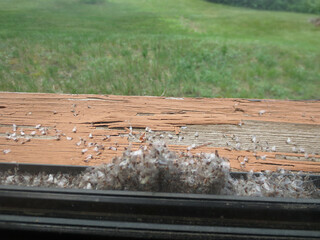 But along the way, I noticed this fluffy cotton that had piled up on the windowsill. Wait a minute - that's not cotton. 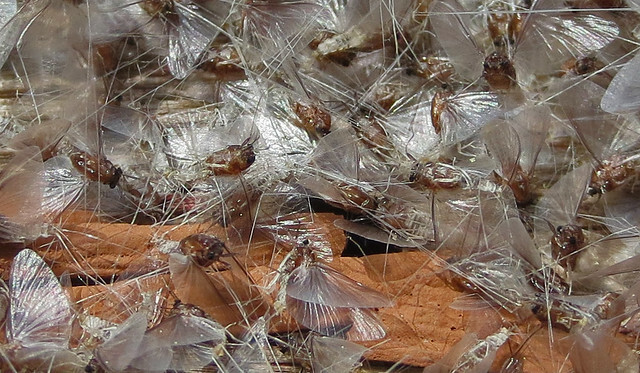 It is a big pile of small bugs! They weren't here last night. Let's take a closer look. How big are they? Well, about the size of a dragonfly's eye. 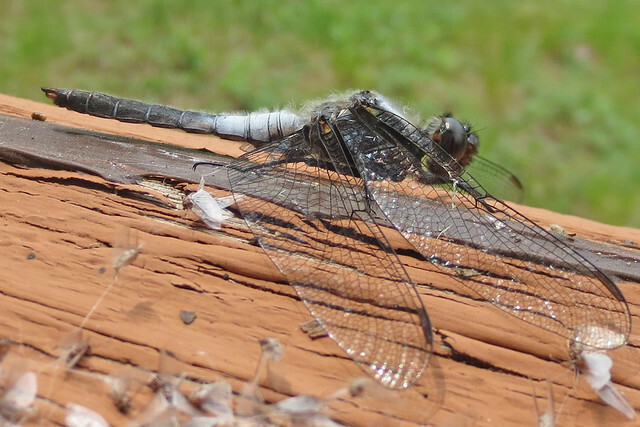 This dragonfly seemed too overfed to try eating any of these. Besides, they prefer to harvest the bugs while on the wing. These were all dead and not going anywhere. I was perplexed about what the little critters were when suddenly this fellow stopped by to look, also. What is that? 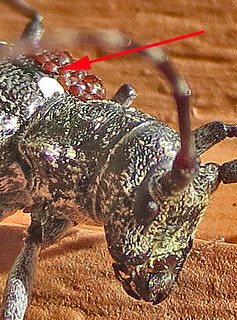 And what it is carrying on its back? Babies? Some kind of parasite? How could I identify these things? If I lived in Washington D.C., I could take them down to the Smithsonian. Or in Manhattan, I could go to the NYC Public Library and ask. In California, someone is probably building an "app" for that. Since I am in the Northwoods, I just went next door to Tom and Barb. "Mayflies," said Tom. 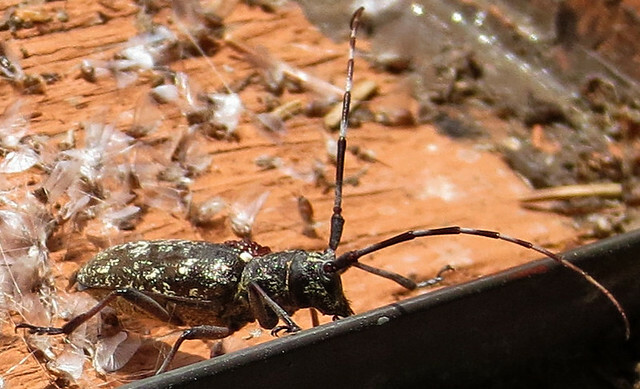 "A Pine Borer," said Barb. 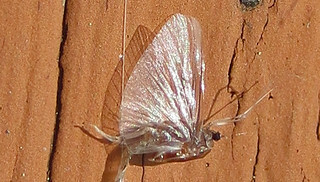 Among the thousands of varieties of mayfly, some are very small. The double white tail is the key to identification. There is a remarkable YouTube video that show one variety laying eggs that hatch a few seconds later. 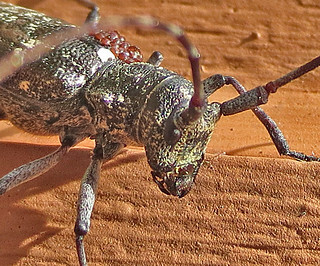 And that Pine Borer? Apparently they like fresh logs more than seasoned. So maybe they won't eat the cabin. 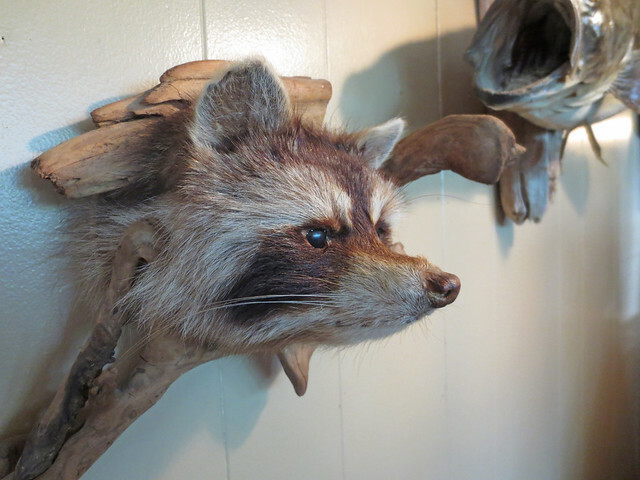 Click on the Pagac's Pines link below to see other Northwoods critters from the neighborhood. 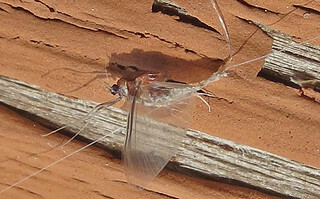 By late afternoon, a gentle breeze had blown away all evidence of the Mayflies.